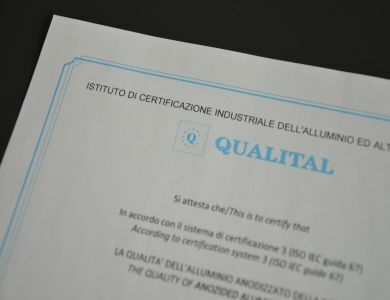 Our aluminium bars are anodised in a QUALANDOD- EURAS-EWAA certified plant, meeting European standards on anodized aluminium and its alloys. This certifying body checks for us the thickness, the quality, the fixing of oxide layer and the aspect of our bars, beside of their resistance to abrasion. The result is a high quality and long lasting products.